Wooden sheet piles are made in various sizes and forms. The nature of site conditions determine, the choice of a particular type, In places where excavation is small and the ground water problem is not serious, 5 cm x 30 cm to 10 cm x 30 cm wooden planks arranged in a simple row will serve the purpose. If the water-tightness is required to a great extent, lapped sheet piling is used. In this case, each pile is made up of two planks, either spiked or bolted to one another. Thus if only earthen banks of small height are to be supported, a single or double row of planks properly erected will perform the function of sheet piling. If complete water tightness is desired or pressure of the retained material wakefield or tongue and grooved sheeting is generally used. To facilitate the driving of the piles, they are usually bevelled at foot. This not only assists in driving but also prevents bruising, if the piles encounter hard stratum. This type of pile is made with three planks, 5 cm, 8 cm or 10 cm in thickness. The planks are nailed together with the middle plank offset forming a tongue on one edge and a groove on the other. The planks are connected by using a pair of staggered bolts at 80 cm centre to centre at intermediate points. The triple lap piles prove stronger in driving. There is no wastage in forming the tongue and groove joints and the piles have less tendency to warp. Timber sheet piles have light weight and as such the equipment required for pile driving is also light. This is considered to be an important advantage timber piles have over piles of other materials. Precast concrete piles are made in square or rectangular cross-section and are driven similar to wooden piles to form a continuous wall. The interlock between two piles is normally provided with the help of tongue and groove joint. The tongue and groove extend to the full length of the piles in most of the cases. 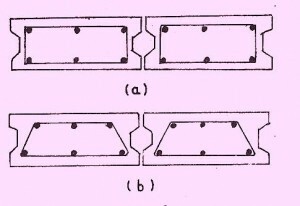 An alternative method of providing joint between two piles is shown below. In this method, after the piles are driven to the required. depth, the joint is grouted with cement mortar 1: 2 (1 cement : 2 sand). The piles are reinforced to avoid formation of cracks due to rough handling or shrinkage stresses. In order to reduce the possibility of damage due to driving impact, the stirrups should be spaced closely near the top and bottom of the piles. The piles are normally bevelled at their feet to facilitate tightly close driving of a pile against the already driven one. Reinforced concrete sheet piles are bulky and heavy and as such they are gradually being superseded by prestressed concrete piles. On account of the numerous advantages the prestressed concrete members have over the conventional type of reinforced concrete members, prestressed concrete sheet piles are commonly used for sheet piling jobs. 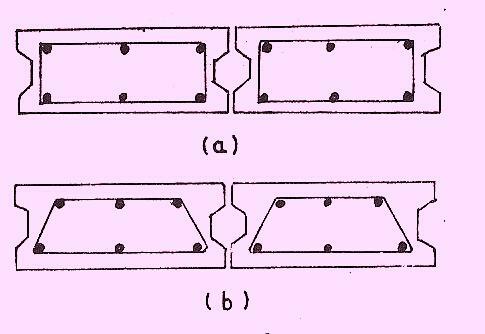 Similar to concrete sheet piles, they are reinforced on both the faces so that they could be handled from either side. They are comparatively lighter in weight, more durable and economical in the long run. They are advantageously used in sea water, since the danger of cracking of concrete is negligible and also the corresponding danger of corrosion of pile reinforcement is reduced. Special shapes and sizes of steel sheet piles are manufactured for meeting the requirement of junctions and other similar situations. Each of the above mentioned type of piles is manufactured in varying widths and lengths. The selection of the type of pile and the section to be adopted depend upon the depths up to which the pile is to be driven, the nature of soil to be penetrated the elevation of the earthen embankment, ground water level etc. 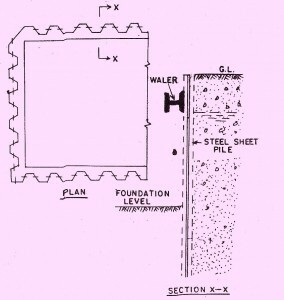 In general, Straight web type of piles are used where the piles are liable to he subjected to tensile forces and interlocking strength is of prime importance (Cellular cofferdam etc); Arched-web type are used where the piles are required to resist bending stresses (in cantilever retaining walls etc,) and Z-web type of piles arc used where the piles are required to resist bending stresses of very large magnitude. Steel sheet piles are driven with the help of pile drivers which may be of drop hammer type or single or double acting hammer driven by steam or compressed air. The outstanding feature of steel sheet piles is that they can be used for greater depths. The continuous interlocking arrangement of the piles gives strength and rigidity to the supported structure. 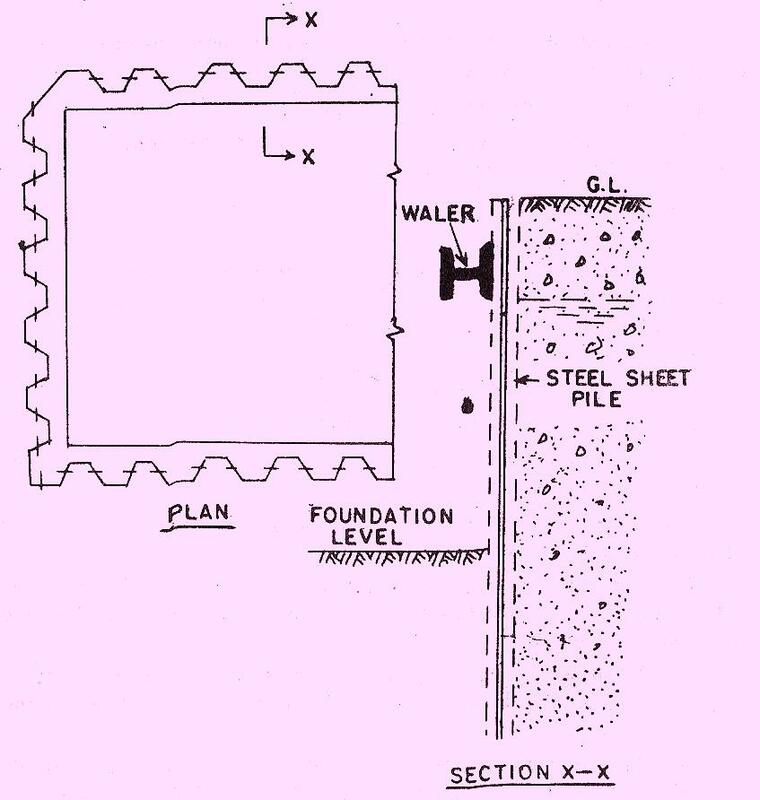 A wall made from properly driven sheet piles leaks very little, hence steel sheet piling is used with advantage in the construction of deep cofferdams. They are commonly used in coastal defence works which are likely to be subjected to tidal action.